We collect old mobile phone handsets to raise money for our school. The collection box is located in the School Office. Over 20 million handsets will be upgraded in the UK this year alone. 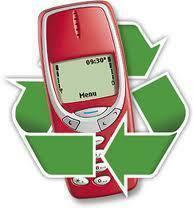 On average, each UK household is home to 4 (or more) tired, unused mobile phones - over 50 million phones nationwide! When upgrading, rejected phones will often be left in the back of a drawer. Unused and neglected. Each day your phone's value depreciates. So, your phones are losing value, awaiting the dump - the school could benefit...But not just that; it's also bad for our planet.